صابری مقدم, علی, نوذری, علی. (1396). بررسی عملکرد کاتالیست صنعتی فرایند ریفرمینگ بخارآب با متان در شرایط گوناگون. نشریه شیمی و مهندسی شیمی ایران, 36(1), 105-115. علی صابری مقدم; علی نوذری. "بررسی عملکرد کاتالیست صنعتی فرایند ریفرمینگ بخارآب با متان در شرایط گوناگون". نشریه شیمی و مهندسی شیمی ایران, 36, 1, 1396, 105-115. صابری مقدم, علی, نوذری, علی. (1396). 'بررسی عملکرد کاتالیست صنعتی فرایند ریفرمینگ بخارآب با متان در شرایط گوناگون', نشریه شیمی و مهندسی شیمی ایران, 36(1), pp. 105-115. صابری مقدم, علی, نوذری, علی. بررسی عملکرد کاتالیست صنعتی فرایند ریفرمینگ بخارآب با متان در شرایط گوناگون. نشریه شیمی و مهندسی شیمی ایران, 1396; 36(1): 105-115. در این پژوهش، تولید هیدروژن با استفاده از فرایند ریفرمینگ بخار آب با متان به­ وسیله کاتالیست صنعتی نیکل بر پایه آلومینا بررسی شد. این فرایند در صنعت در دمای C° 900-750 انجام می­شود. به منظور کاهش مصرف انرژی، توسعه کاتالیست­ هایی برای کاهش دمای عملیاتی مورد توجه قرار گرفته است. بنابراین بررسیعملکرد کاتالیست صنعتی و شناخت علت ­های غیر فعال شدن آن در شرایط گوناگون و به­ ویژه در دمای کم اهمیت زیادی دارد که در این پژوهش مورد بررسی قرار گرفت. از آنالیز CHN برای به ­دست آوردن مقدار کربن موجود در کاتالیست پس از فرایند و از آنالیز XRD و رابطه شیرر برای بررسی سینترینگ کاتالیست استفاده شد. در طی مدت آزمایش، تبدیل متان در دماهای C°750 و C°850، به تقریب ثابت و به ترتیب 8/75 و 4/84 بود، ولی در دمای C°650 و C°550 تبدیل متان روند کاهشی داشت. درصد تبدیل متان و درصد مولی هیدروژن با افزایش دما، افزایش یافت، ولی پس از دمای C°750، شیب درصد مولی هیدروژن نسبت به درصد تبدیل متان کاهش یافت.از نظر تولید هیدروژن و درصد تبدیل متان، مناسب ­ترین دما C°750 بود و با افزایش دما بیش از این مقدار، بازده تولید هیدروژن تغییر محسوسی نداشت و از سویی انتخاب پذیری CO افزایش یافت که دلخواخ نیست. با افزایش نسبت بخار به متان، تبدیل متان در دماهای گوناگون با شیب کم افزایش و انتخاب پذیری CO کاهش یافت. با کاهش اندازه ذره­ های کاتالیست، تبدیل متان افزایش پیدا کرد. در طول مدت آزمایش با افزایش دما، مقدار کربن رسوب کرده روی کاتالیست کاهش یافت. با بررسی کاتالیست استفاده شده در صنعت دیده شد که عامل غیر فعال شدن کاتالیست با سینترینگ نسبت به غیر فعال شدن توسط رسوب کربن نقش مؤثرتری دارد..
 Gupta R., "Hydrogen Fuel: Production, Transport, and Storage", CRC Press, New York (2008). 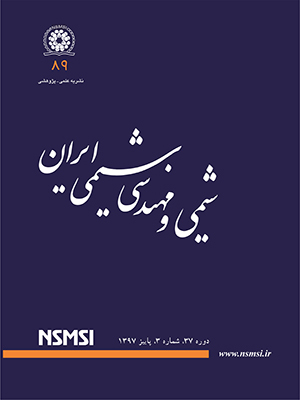 Zamaniyan A., Zoghi A., Software Development for Simulation of Reformer Furnace, Iranian Journal of Chemistry and Chemical Engineering (IJCCE), 25(4): 55–71 (2006). Anbia M., Hoseini V., Mandegarzad S., Motaee E., Sheykhi S., Synthesis of Nanoporous Metal Organic Framework MIL-53-Cu and Its Application for Gas Separation, Iranian Journal of Chemistry and Chemical Engineering (IJCCE), 33(4): 25 – 28 (2014). Halabi MH., De Croon MHJM., Van Der Schaaf J., Cobden PD., Schouten JC., Intrinsic Kinetics of Low Temperature Catalytic Methane–Steam Reforming and Water–Gas Shift over Rh/Ce α Zr1−αO2 Catalyst, Applied Catalysis A: General, 389(1): 80-91 (2010). وافری، بهزاد؛ اکرمی، حمیدرضا؛ کریمی، غلامرضا؛ مدل‌سازی فرایند ریفرمینگ گاز‌طبیعی با بخار آب در راکتور غشایی پالادیم ـ نقره برای تولید هیدروژن خالص، نشریه شیمی و مهندسی شیمی ایران، (3) 30: 25 تا 37 (1390). Irani M., Resolving a Challenge in the Modeling of Hydrogen Production Using Steam Reforming of Methane in Monolith Reactors Using CFD Methods, Advances in Materials Physics and Chemistry, 2(04): 248-257 (2013). Mbodji M., Commenge j., Falk l., Steam Methane Reforming Reaction Process Intensification by Using a Millistructured Reactor: Experimental set up and Model Validation for Global Kinetic Reaction Rate Estimation, Chemical Engineering Journal, 207(1): 871-884 (2012). El-Bousiffi M., Gunn D., A Dynamic Study of Steam-Methane Reforming, International Journal of Heat and Mass Transfer, 50(3): 723–733 (2007). Van Beurden P., On the Catalytic Aspects of Steam-Methane Reforming. Energy Research Centre of the Netherlands (ECN), Technical Report I-04-003 (2004). Bej B., Pradhan N., Neogi S., Production of Hydrogen by Steam Reforming of Methane over Alumina Supported Nano-NiO/SiO2 Catalyst, Catalysis Today, 207(3): 28-35 (2013). Kusakabe K., Sotowa K., Eda T., Methane SteamReforming over Ce–ZrO 2-Supported Noble Metal Catalysts at Low Temperature, Fuel Processing Technology, 86(3): 319-326 (2004). Liu Z, Jun L., Roh H., Park S., Hydrogen Production for Fuel Cells Through Methane Reforming at Low Temperatures, Journal of Power Sources, 111(2): 283-287 (2002). Chen Y., Wang Y., Xu H., Xiong G., Efficient Production of Hydrogen from Natural Gas Steam Reforming in Palladium Membrane Reactor, Applied Catalysis B: Environmental, 81(3): 283-294 (2008). Belhadi A., Trari M., Rabia C., Cherifi O., Methane Steam Reforming onSupported Nickel Based Catalysts. Effect of Oxide ZrO2, La2O3 and Nickel Composition, Open Journal of Physical Chemistry, 3(2): 89-97 (2013). Nieva M., Villaverde M., Monzon A., Steam-Methane Reforming at Low Temperature on Nickel-Based Catalysts, Chemical Engineering Journal, 235(1): 158-166 (2014). Halabi M.H., De Croon M.H.J.M., Van der Schaaf J., Cobden P.D., Schouten J.C., Low Temperature Catalytic Methane Steam reforming over Ceria–Zirconia Supported Rhodium, Applied Catalysis A: General, 389(1): 68-79 (2010). Soria M.A., Mateos-Pedrero C., Guerrero-Ruiz A., Rodríguez-Ramos I., Thermodynamic and Experimental Study of Combined dry and Steam Reforming of Methane on Ru/ZrO2-La2 O3 Catalyst at Low Temperature, International Journal of Hydrogen Energy, 36(23): 15212-15220 (2011). Angeli Sofia D., Monteleone G., Giaconia A., Lemonidou AL., State-of-the-Art Catalysts for CH4 Steam Reforming at Low Temperature, International Journal of Hydrogen Energy, 39(5): 1979-1997 (2014). Deevi S., Sikka V., Nickel and Iron Aluminides: an Overview on PropertiesProcessing, and Applications, Intermetallics, 4(5): 357-375 (1996). Lisboa J., Santos D., Passos F., Noronha F., Influence of the Addition of Promoters to Steam Reforming Catalysts, Catalysis Today, 101(1): 15-21 (2005). Delgado J., Águeda V., Uguina M., Sotelo J., Adsorption and Diffusion of H2, CO, CH4, and CO2 in BPL Activated Carbon and 13X Zeolite: Evaluation of Performance in Pressure Swing Adsorption Hydrogen Purification by Simulation, Industrial & Engineering Chemistry Research, 53(40): 15414-15426 (2014). Jeong D., Jang W., Shim J., Han W., Low-Temperature Water–Gas Shift Reaction over Supported Cu Catalysts, Renewable Energy, 65(1): 102-107 (2014). Jeong D., Subramanian V., Shim J., Jang W., High-Temperature Water Gas Shift reaction over Fe/Al/Cu Oxide Based Catalysts Using Simulated Waste-Derived Synthesis Gas, Catalysis Letters, 143(5): 438-444 (2013). Liu K., Song C., Subramani V., "Hydrogen and Syngas Production and Purification Technologies", John Wiley & Sons, New York (2010). Xu J., Froment G., Methane Steam Reforming, Methanation and Water‐Gas Shift: I. Intrinsic Kinetics, AIChE Journal, 35(1): 88-96 (1989). Hou K., Hughes R., The Kinetics of Methane Steam Reforming over a Ni/α-Al2O3 Catalyst, Chemical Engineering Journal, 82(1): 311-328 (2001). Sehested J., Carlsson A., Janssenset T., Hansen P., Sintering of Nickel Steam-Reforming Catalysts on MgAl2O4 Spinel Supports, Journal of Catalysis, 197(1): 200-209 (2001). Christensen K., Chen D., Lodeng R., Holmen A., Effect of Supports and Ni Crystal Size on Carbon Formation and Sintering During Steam Methane Reforming, Applied Catalysis A: General, 314(1): 9-22 (2006).